My advice on this blog represents my own personal opinion. Copyright © Peter Melzer. No liability is assumed. Cold shutdown of an intact nuclear reactor, also known as mode 4 (see Risk Assessment of Operational Events Volume 4 – Shutdown Events, Revision 1.0, April 2011), essentially denotes the state in which the water in the reactor pressure vessel can be maintained below boiling at atmospheric pressure without the constant need of adding water to the closed-loop cooling system. The operator of the Fukushima Dai-ichi Nuclear Power Station severely damaged by the Tohoku Earthquake and Tsunami last March, Tokyo Power and Electric Co. (TEPCO), maintains that the three reactors the fuel core of which melted down have reached cold shutdown last autumn. The three reactors were in operation at the time of the quake, which triggered seismic SCRAMs, precipitating emergency shutdowns. In its report with the title "Unit 1-3 core about the state of Fukushima Daiichi Nuclear Power Station" dated Nov. 30, 2011, TEPCO examines the fuel core meltdowns in the stricken reactors. The company summarizes its synopsis on the state of the reactor cores in the schemas shown in order from Unit 1 to Unit 3 below. The schemas deserve close inspection. Attention must be paid to the location of the corium, that is the molten fuel rods, and the water levels in each reactor. Corium melted through the reactor pressure vessels of the three reactors. The reactor pressure vessels are enclosed in primary containments consisting of a pear-shaped drywell connected to a ring-shaped, partially water-filled suppression chamber also known as wetwell. The fuel core of the oldest reactor, Unit 1, melted down most, slumping to the reactor pressure vessel's bottom, burning through its steel and into the 10 meter-thick concrete floor of the drywell below. In the other units, most melted fuel presumably resides inside the reactor pressure vessels, and only small amounts are believed to have reached the drywell floor. The heat from radioactive decay in the corium must be continuously cooled to confine corium flow and avoid a fuel geometry potentially conducive to re-criticality. Hence, TEPCO has been pumping water into the reactor pressure vessels through feedwater and core sprayer (CS) lines at rates ranging from roughly 4 (Unit 1) to 18 m3/h (Unit 2). Paths of the injected water vary among the reactors and flow rates have been altered between paths. Regardless, considering a reactor vessel volume of 400 cubic meters and more, it would take days to fill the vessels at the total flows TEPCO administers. Despite the water injections, no reactor pressure vessel is completely filled. Water needs constantly supplied to prevent boil off. At Unit 1, some water seems to collect at the bottom of the reactor pressure vessel. Most water, however, appears to leak via the drywell into the wetwell, which is almost completely filled. Unit 2 shows no water in the reactor pressure vessel, more in the drywell, and less in the wetwell. At Unit 3, the water also seems to pass entirely through the reactor pressure vessel, filling drywell and wetwell to the highest level observed. 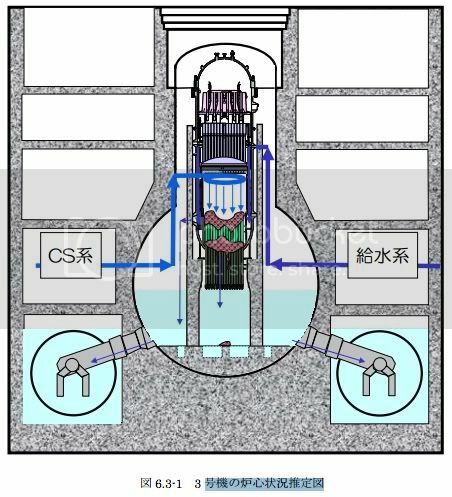 Eventually, water leaking from the three reactors wends its way into the turbine building basements from which TEPCO pumps it through newly constructed filter systems for decontamination back into the reactor pressure vessels. The precise leak paths from the reactors remain unknown. TEPCO reports reactor temperatures regularly. The measurements are based on thermostats that were originally installed at various strategic locations around the reactor vessels, and may have been damaged during the course of the accident. Verification of sensor functionality is difficult. Repair or replacement is impossible to date because of high radiation. Therefore, the reported temperatures must be taken with a grain of salt. Moreover, location and state of the molten fuel can only be inferred from indirect observation. 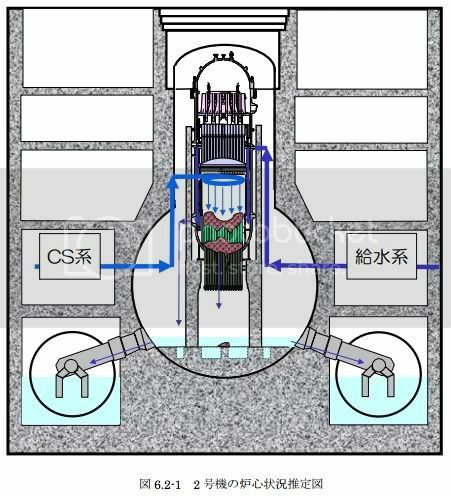 By contrast, cold shutdown implies water temperature control with precise and accurate knowledge of the reactor parameters and may not entirely pertain to the situation at Fukushima Dai-ichi Nuclear Power Station. 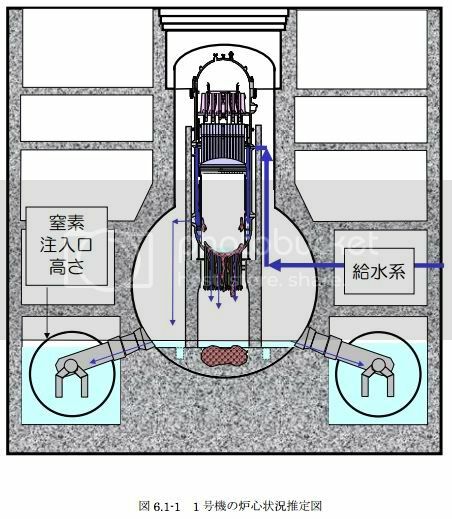 The water TEPCO injects through the feedwater line mostly flows down the reactor pressure vessel's inside wall, whereas the water injected through the core sprayer irrigates the center where the fuel core used to be located. Consistent with the company's hypothesis that most molten fuel in Unit 2 accumulated at the center of the reactor pressure vessel's bottom, TEPCO increased the flow of the core sprayer and reduced the flow through the feedwater orifice about two weeks ago, apparently in the hope of cooling the core melt at the center more effectively (TEPCO press release with the title "Plant Status of Fukushima Daiichi Nuclear Power Station (as of 3:00 pm, February 14)"). The result was a dramatic increase in temperature above the boiling point measured at one of three locations at the bottom of the reactor pressure vessel. The temperature kept rising until the thermostat failed. Reversing the water flow pattern was to no avail. Only doubling the total flow rate seemed to help. TEPCO investigated the possibility of renewed nuclear fission, searching for radioactive fission products in air and water samples with nuclear decay energy spectrometry, and concluded that no re-criticality occurred (TEPCO press release with the title "Plant Status of Fukushima Daiichi Nuclear Power Station (as of 3:00 pm, February 15)"). 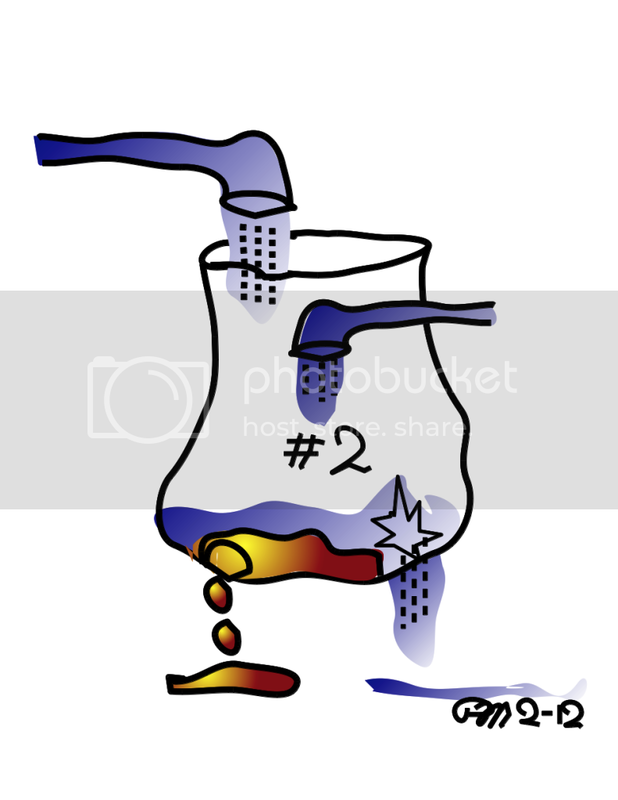 Regardless, the fragility of water temperature control in Unit 2's reactor suggests that it is quite possible that much water the company injects bypasses a substantial portion of the molten fuel and only cools the reactor pressure vessel. This is the most likely scenario! TEPCO released this video on Jan. 20, 2012. The video was captured with an endoscopic camera inside the primary containment of Fukushima Daiichi Nuclear Power Station Unit 2. This is TEPCO's first visit inside the primary containment of a reactor with a fuel meltdown. Extreme levels of radiation cause the color pixel artifacts. Note water raining from above intensely and persistently, the reddish-brown corrosion on the containment's inside wall and piping, and no standing water anywhere in view of the camera (02/19/2012). In today's report with the title "Result of the second investigation inside of Primary Containment Vessels, Unit 2, Fukushima Daiichi Nuclear Power Plant," TEPCO released its findings from a second endoscopic exploration of Unit 2's primary containment vessel with improved equipment. In addition to the first exploration's findings, TEPCO discovered water standing roughly 60 cm deep at the bottom of the drywell. The water temperature was about 50 ℃; 40 ℃ were measured in the air at higher elevations. These observations suggest that the drywell bottom around the pedestal room does not seem to be leaking. Information of the conditions inside the pedestal room is lacking. This room is located directly under the reactor pressure vessel (RPV) and may contain the melted fuel that escaped the RPV. Its doors are normally sealed. Regardless, water TEPCO constantly pumps into the RPV seems to wend its way into the drywell from which it flows into the suppression chamber through the pipes connecting the two. The chamber must have sprung leaks through which the inflowing water seeps into the reactor building's basement (03/26/2012). The diagram below shows TEPCO's and the Japan Atomic Energy Agency's most recent estimates of the fractions of melted-down fuel residing inside and outside each unit's reactor pressure vessel (RPV). Note, all of unit 1's fuel is presumed to have relocated to the pedestal room below the vessel (05/21/2014). Three days ago, almost six years after the accident, TEPCO was able to publish pictures of a first glimpse into the space under Unit 2's reactor pressure vessel (RPV) provided by a robotic camera (TEPCO/IRID, Jan. 31, 2017: Pre-investigation results of the area inside the pedestal for the Unit 2 Primary Containment Vessel investigation). The robot's dosimeter measured roughly 500 Sv/h. At that exposure rate humans would accumulate a lethal dose in less than a minute. The company identified suspected lumps of melted fuel on a grating five meters beneath the RPV bottom head and subsequently released a collated picture of panned robot images showing an estimated one meter by one meter hole near the center of the grating [TEPCO, Feb. 2, 2017: Pre-investigation results of the area inside the pedestal for the Unit 2 Primary Containment Vessel Investigation at Fukushima Daiichi Nuclear Power Station(examination results of digital images)]. There can be no doubt now that melted fuel exited the RPV, burnt through the grating and slumped to the bottom of the primary reactor vessel 3.5 meters below in accord with the scenario presumed for Unit 1 above. The picture below shows TEPCO's collation (02/02/2017). 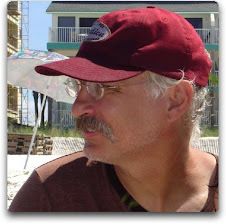 I thank the contributors of SimplyInfo.org without whose help I could not have written this post. This site is viewed best with Firefox! TigerDirect Exclusive Deals! Limited Time Offers! Act Now And Save! Buy StuffIt Deluxe 12 via Digital Download! Want to animate like Pixar? Try Maya! You may wish to try the student edition first! Check out books at Amazon!